While definitions vary, change management generally refers to how teams and companies implement organizational change. Often referred to as the only constant, change—and the management of it—is an ever-evolving process that affects everyone. And although there is no one right or wrong way to mitigate change, there are a few tried-and-true change management models that organizations return to again and again. A physicist by trade, Lewin used the example of how to turn a cube of ice into a cone of ice and applied it to organizational change management. First, a team or organization must “unfreeze” their current process and perceptions when preparing for upcoming changes. This helps the team approach the task or challenge with a clean slate without bias or bad habits. Next, it’s time to implement changes. Effective change requires clear and constant communication across all affected channels both during and after deployment. Finally, it’s time to “refreeze.” Assuming accurate feedback and ongoing communication occurred during the “change” step, the refreeze step locks into place the new process. Like ice molds, teams and organizations need to move away from an old mold before they can fit into a new one. The Lewin change management process, while too simplistic for some, is favored by others for its ability to uncover old patterns or overlooked problems as well as for its clean approach to new ways of thinking. Since organizational change is directly dependent upon its employees for successful implementation, it’s critical for individuals to have a clear understanding of what changes are occurring, why they are occurring, and how they affect them personally. 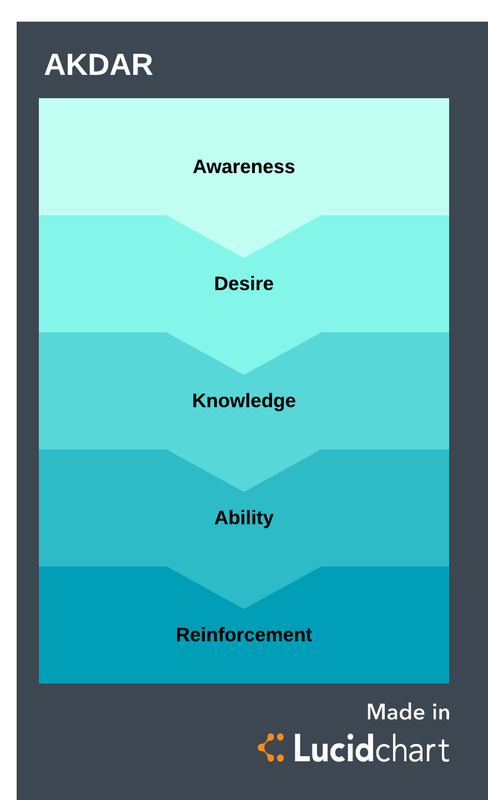 The ADKAR model helps individuals process change through clearly defined stages that enable them to both understand and accept the changes at hand. Enable action by removing barriers. Kotter’s change management process skillfully turns possibly resistant individuals into receptive participants through trust, transparency, and teamwork. By identifying the end goal, employing everyone’s involvement, and executing the impending changes together, this process remains a long-standing favorite among change management models. If teams and companies lose sight of whom their changes impact the most, then their attempts to make those changes will be for naught. Changing an organization is not like changing a tire; there are emotional factors to consider. 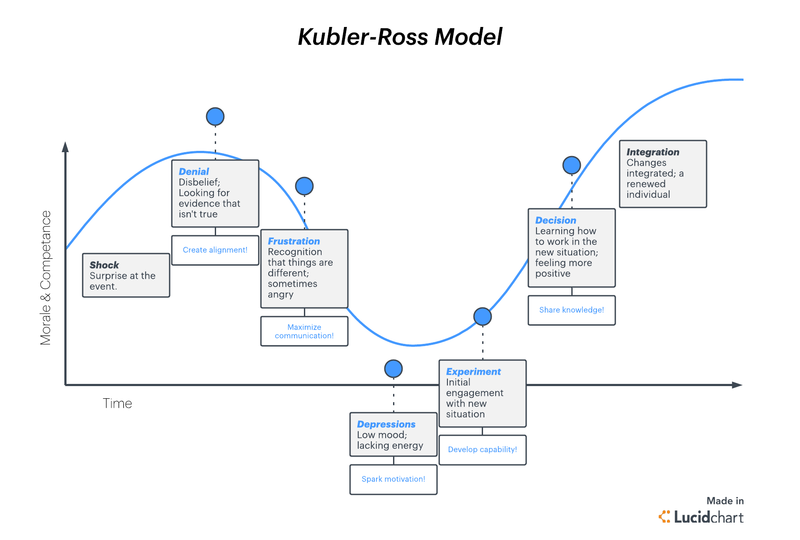 One caveat to consider with this change management strategy is that these stages are not always sequential and that everyone can progress through them differently, so its effectiveness is not always predictive. As such, it can also be used to supplement other change management process steps for a two-fold approach. With the right tools, planning for even the broadest of changes within an organization becomes possible. 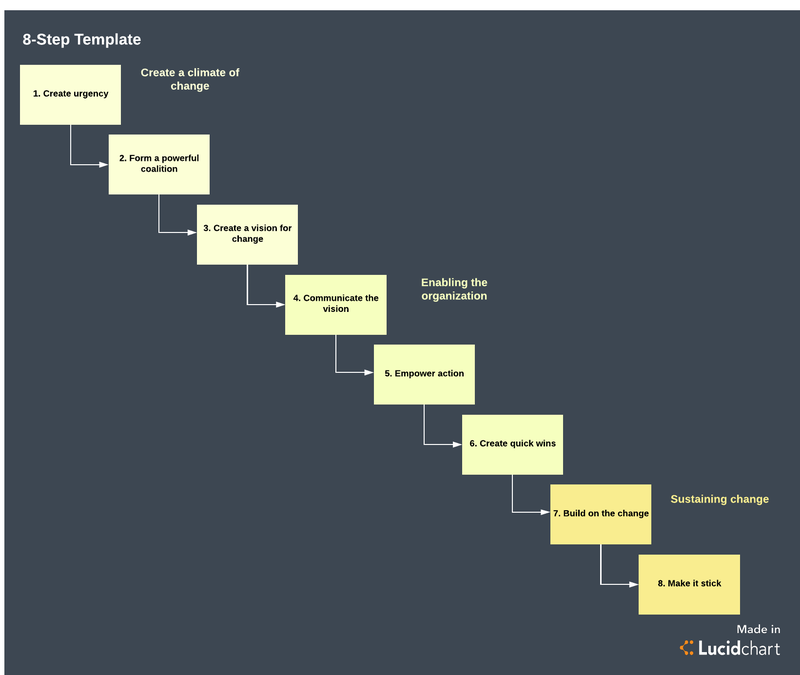 Sign up for your free Lucidchart account today to start customizing your own change management process.